Following the French and Indian War (1756-1763) and the Treaty of Paris (1763), France turned over all of its North American colonies to Great Britain. Native Americans saw they had lost a possible ally and now stood alone against the British. Pontiac of the Ottawa Indians attempted to unite the Native American tribes in the Ohio Country against the British in 1763. This uprising became known as Pontiac's Rebellion. During Pontiac's Rebellion, Native Americans loyal to Pontiac attacked Fort Sandusky. The English had built the fort as a blockhouse in 1745. It was located on the portage between the Sandusky River and Lake Erie. The British used the fort off and on between 1745 and 1761 to protect British citizens trading with the Ohio Country natives. During the French and Indian War in 1761, Ottawa Indians, working with the French, attacked Fort Sandusky. They burned it to the ground and killed fifteen of the sixteen men sent to garrison the fort. The only survivor was the fort's commander, H.C. Pauli. The Ottawas took him captive and eventually allowed an Ottawa woman, who had lost her husband, to adopt him. Pauli was able to escape and to make his way back to the fort, which a fresh detachment of British soldiers had rebuilt late in 1761. To weaken the Native Americans' ability to attack, in 1762 the British government prohibited traders from providing the Indians with guns, razors, knives, hatchets, flints, and gunpowder. Ohio Country natives, especially the Shawnee Indians and the Wyandot Indians, believed that the English intended to weaken them militarily by refusing to trade arms before conquering them. British policy, not to mention the arrival of English settlers, also angered the Indians. 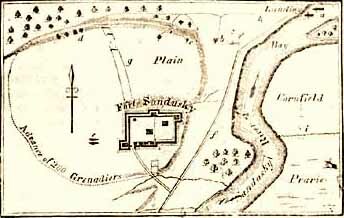 By 1763, conditions at Fort Sandusky had become even more dangerous. Only thirteen men defended the fort and Great Britain had not garrisoned any of their other outposts in Ohio. When Fort Sandusky came under attack, Pontiac's followers easily overcame the men, killing them all.